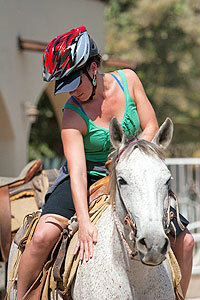 Horseback Riding Excursion in Puerto Vallarta - Swim With Your Horse! This excursion is special because it is the only horseback riding tour in Puerto Vallarta where you can actually swim with your horse! Not only that, but you can bask in volcanic hot springs, relax at a beautiful Hacienda and sample different varieties of Tequila, the Mexican national liquor. A great combination of activities! Start out at our beautiful Hacienda, a real working ranch nestled in the Sierra Madre foothills. Get matched up to your healthy, well-trained horse, and go for a ride, watching breathtaking vistas and even going for a swim with your horse! Stop to bathe in the soothing waters of our volcanic hot springs and then after the ride, relax at the Hacienda, eat or drink at the restaurant, and learn about how tequila is made. Runs: Twice Daily, Monday through Saturday at 9:00 AM and 1:00 PM. We can also do this tour on Sunday for groups of at least 6 people. This tour is seasonal due to river levels and runs from October 15 through July 15 only. The rest of the year, see our other horseback riding tours. Departs From: Pick-ups in Marina Vallarta, Puerto Vallarta and Conchas Chinas. Detailed meeting instructions will accompany your confirmation. Kids: Must be at least 5 feet (152cm) tall and 8 years old to participate. Kids prices apply to ages 8-15 years. Restrictions: Weight limit is 250 lbs (113 kg). Pregnant women and physically challenged individuals cannot participate in this tour. Note: This tour is seasonal and runs October 15 thru July 15 only, due to high river levels during rainy season. If it is borderline, please contact us as exact dates change. Crossing the river with your horse will depend on the water current. If the current is too strong, we won't be able to cross the river and get to the hot spring pools, but you will have a longer riding time.